Twelve Pearls offers various types and styles of fine jewelry, from classic heirloom-look to the most contemporary styles. All items are specially designed and created with your best moments in mind. MORE INFO. Cultured pearls and Natural pearls. Natural Pearls occur when a particle naturally, or accidentally becomes lodged in a mollusk's shell. Nature causes layers of nacre to coat and cover the particle. The shape of natural pearls will vary, depending on the shape of the original particle that is being coated. Natural pearls are the most rare and generally most expensive. Natural pearls are typically sold by carat weight. Most of the natural pearls that are available in these times would be considered vintage pearls. Cultured Pearl also grow inside of a mollusk. The difference come from the fact that the particle is placed in the shell by humans. The shell is carefully opened and the pear farmer places an object into the shell. The shapes of the final pearl is determined by the shape of the particle that was placed within the shell. In this way, certain desired shapes can be planned. Over time the creature continues to cover the particle with more layers of nacre. The length of time that the particle remains within the shell, the kind of water where it lives, and the actual type of mollusk that "grows" the pearl are determining factors in the size and quality of the final harvested cultured pearl. Cultured pearls are sold by their size in millimeters. Saltwater Pearls originate from within a saltwater mollusk. Saltwater pearls may be either natural or cultured. 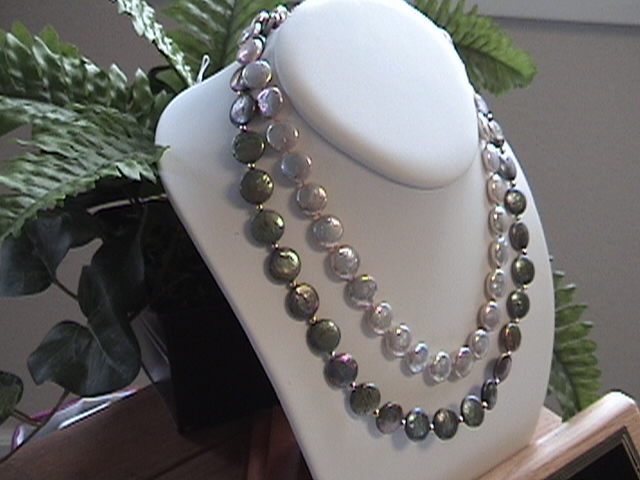 Freshwater Pearls are those that are grown inside of a freshwater mollusks, living in waters of a river or lake. Spherical Pearls are the round, more traditional and most desirable shape. The more perfect and round the shape of the pearl, the more valuable it is. Symmetrical Pearls are in pear shapes and other shapes that have symmetry from one side to another. These are not the true round shape. Baroque Pearls are the irregular shaped pearls. They generally are the less expensive category of pearls, but have a unique beauty that many prefer. Take care not to store your pearls in a way that they are mixed with other jewelry. They can become scratched by the metal or gemstones of the other pieces. Use a special area in your jewelry case, or jewelry box for the pearls, or keep them in a pouch or bag made of chamois or other soft material. It is recommended that fine pearl jewelry should be restrung periodically to assure that the silk or nylon cord holding them is in good condition, thus better protecting the piece from possible breakage and ultimate loss of the item. With proper care, your authentic cultured or natural pearl jewelry can be treasured heirlooms for many generations. Pearls are called organic gems because they made by, and within living creatures. How this happens: a small particle is placed in, or makes its way into the shell of certain types of oysters and clams. The shell-fish then begins to coat the particle with layer after layer of a substance called nacre. Over time it becomes thicker, and finally forms a pearl. Pearls are classified by two distinctive things: their shape and their origin. See More Info in the Pages section of this website. Or Go shopping for pearl jewelry: TWELVE PEARLS STORE and The Journey Enterprises.